A local Arizona newspaper has a cool article, which actually doesn't seem to follow the the mainline media trend "wingsuits are bad, m'kay? ", about a member of the US Army Golden Knights parachute team, Staff Sgt. 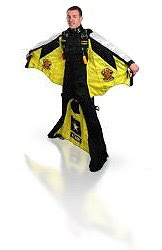 Ben Borger, attempting to break the world record for distance flying in a wingsuit. The record is currently held by the Spanish Red Bull team that flew across the Straight of Gibraltar. Author and BMCI Scott Campos will be joining him on the jump, scheduled for tommorow Februari the 21st. Read it here. Turbolenza Wingsuit Tour Alps 2008 - B.A.S.E. Want to work on your glide angle? Take it to the mountains..
Patrick de Gayardon - the true pioneer..